Lakme Fashion Week Spring Resort 2018 saw some of the best designers showcasing their latest collections. We fell in love with so many that it was difficult to select one. But a particular designer duo caught our eye and we just can’t stop praising their work! Shyamal and Bhumika from Mumbai unbridled their collection ‘Wonderland’ at the Lakme Fashion Week 2018. For this collection they seeked inspiration from a mystical wonderland, hence the name. The depiction of a fairy tale wedding was brought to life through their spectacular work. Numerous beads, crystals, and pearls have been tirelessly stringed together on tulle and hand-woven silks. Whispering blues, shadow greys, and striking violets bring heightened emotions of affection, sincerity, and enchantment. 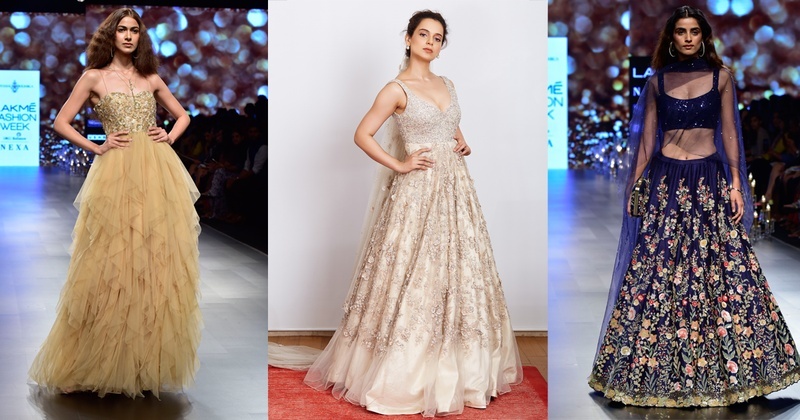 Superstar Kangana Ranaut was their showstopper or their ‘fairytale muse’ as they like to call her. This February, they are all set to launch their first store in Delhi at India definitive luxury destination- DLF Emporio. Have a look as we take you through their enchanted collection! 1. We are in LOVE with this ivory gown adorned with beads and sequences. 2. This navy blue lehenga with rich embroidery is perfect for any evening occasion! 3. This baby peach lehenga with intricate zari work is too pretty to ignore! 4. Ice blue satin saree for the win! 5. Look at this peach gown with a front slit! 6. A dusty pink lehenga with floral border is all you need! 7. A classic golden gown with loose ruffles, calling out to every diva out there! 8. A navy blue saree with light floral embroidery making a statement! 9. Kangana Ranaut walking down with the dynamic duo, Shyamal and Bhumika. 10. The Queen slaying it with the creators of the Wonderland! We are still going through their collection, just admiring their work. Kudos to Shyamal and Bhumika for unveiling such a beautiful and fairytale like line for Spring Summer 2018.